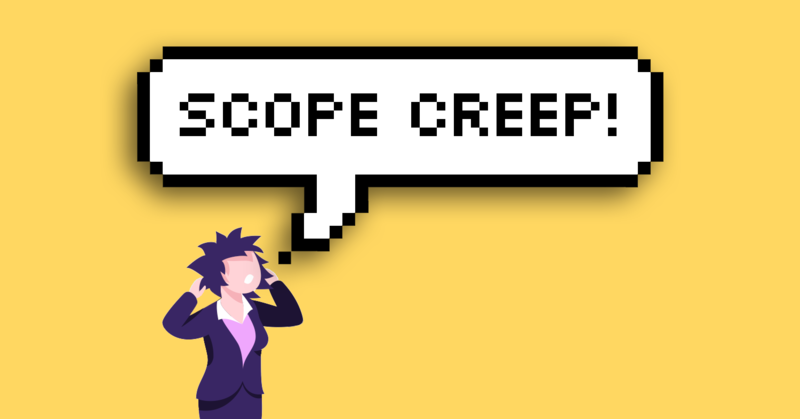 Scope creep, one of the real challenges when managing a project. Often it hits you with a sneak attack, and before you know if it, your project is off-track and off-budget. In some cases, scope creep of one project threatens to throw your other projects off as well by reserving your precious resources. There are ways to avoid scope creep altogether, but you need to start right from the beginning. The most important factor to avoid extra work from sneaking up on you is to understand your client. Yes, right from the first meeting - make sure you understand what your client needs as plainly as possible. Make sure you're both on the same page, that you have the same vision for the project. It's equally as important to make sure your team understands the vision as well when moving through the implementation funnel. First things first, the best way to understand your client is to, obviously, talk with your client. Sit down together, brainstorm the idea, and spend some time listening to your client's vision, your vision for the project, and combine the two. Managing a project is a collaborative effort. This effort includes both your internal- and your external stakeholders and not to mention, your client. When you both understand the vision for the project, you can then move forward to defining the foundational requirements of the end product. What is it? What problem does the project address for the product? What needs to be solved? How should the product resolve the problem? Who is going to use the product, and how? What would be the best possible experience for the end user? What would be the simplest solution? What would be the most advanced solution? What is the aim of the product? Answer each question, and save it for later. Based on the vision and the requirements defined earlier; now it's time to consider the scope. What is inside, and what is outside of this project's scope? Define what is within the scope of this project, and make sure both your team and your client understand the boundaries. Here, it's important to notice that it doesn't necessarily have to be the last, and only, project for this product. You can always expand the project into a second project or add an extra milestone with an extended proposal. If further requests come up, then is it better to have them in a separate project than being part of the initial sales proposal? All things considered, defining every aspect of the scope will set your project up for success and will help to avoid scope creep. In the case, that new requests may pop up along the way, make sure to explain to your client the process of adding new tasks to the project. Your defined limitations from earlier should always be in mind, and you should always keep an eye on the project timeline, your schedule, and resources that might potentially be allocated to other projects in your organization. When the boundaries are defined, and the processes explained, you can move on to setting up the actual Statement of Work (SOW). The Statement of Work should clearly (always clearly) define the milestones and tasks of the project. This is especially important when managing a larger team that might not know all the pieces of the puzzle. Make sure to clearly define the task, how it should be used by the end user (like a User Story). Likewise, if needed, define the limitations for the feature of this project. Scope creep doesn't always come from outside. Often it might actually stem from the goodwill of your team members. They hopefully want to deliver the best possible solution for your client, but at times this might reach too far out of scope, especially if you have an amazing team where everybody wants to deliver their best. Great projects need great management tools. Great teams need great collaborative tools. Simple as that. Sadly, many tools are neither great nor very collaborative in nature. Some tools are very complicated to use, and not at all a fun and inspiring environment to enter. Other tools are pretty good, but then often only focus on a certain part of a project, i.e., the task management part (i.e., Trello), the time and budget part (i.e., Harvest), or the scheduling part (i.e., 10,000ft). What if you could combine all of these tools into one solution without making it too complicated and tedious? That is the mission of Forecast. A collaborative Professional Services Automation (PSA) tool with both Project- and Resource Management built-in. Giving your client a view into your process by inviting them onto your project management tool can be a great way of ensuring a more collaborative and transparent workflow. Tools like Forecast allow you only to give the access you find appropriate, whether that is a limited view as a Client or the perspective of a team member as a Collaborator. Building and sharing progress reports are equally straightforward with a simple password-protected link. Dealing effectively with scope creep, you need to have a good sense of the scope, and the ability to respond confidently with either a yes or a no. Forecast has a smart feature to manage this process inside of your project. As part of creating tasks, Forecast has an approved or disapproved column. This ensures that only approved tasks will move on to the task management board for the rest of the team to see. Having approved tasks minimizes the risk of your team members beginning to work on a task that is not yet approved by the Project Manager. If a task is initially deemed out of scope and thereby disapproved, you can easily create a new extended proposal in just a few seconds. Through the rate cards, roles and time estimations linked to the project and new task(s), you will instantly be able to see the price of completing the extra work. This is a great way to do extended sales proposals based on single tasks or a group of new requests submitted by your client. If the proposal is accepted, you can quickly move the tasks along, either directly to the to-do column for immediate implementation, or to an upcoming milestone or sprint, simply by ticking the Approved box. Following the nine steps above should significantly improve your stakes of dealing with scope creep. No matter, if you're eagerly taking on extra work, or instead prefer moving further requirements and requests to a separate project - these steps can hopefully help you out. If you're interested in trying out the tool mentioned in this article, you can sign up for a free webinar, a free live demo, or a free trial here. Also, if you're interested, we have a list of related articles for you below. Happy diggin'! What is a Statement of Work?